On behalf of the Meririonnydd Special Riding Group, thank you so much for your wonderfully generous donation. We are a well established local charity which relies heavily on the support of our community to enable us to provide weekly horse riding and therapeutic sessions for those with additional needs in Gwynedd. Your organisation's substantial donation will ensure that we are able to run our sessions and look after our Group horse Sheri. If you would like to find out more about our work, you would be welcome to come and visit us, or have a look at our Facebook page. Once more, many many thanks for choosing us as one of your charities to support, it means a great deal. 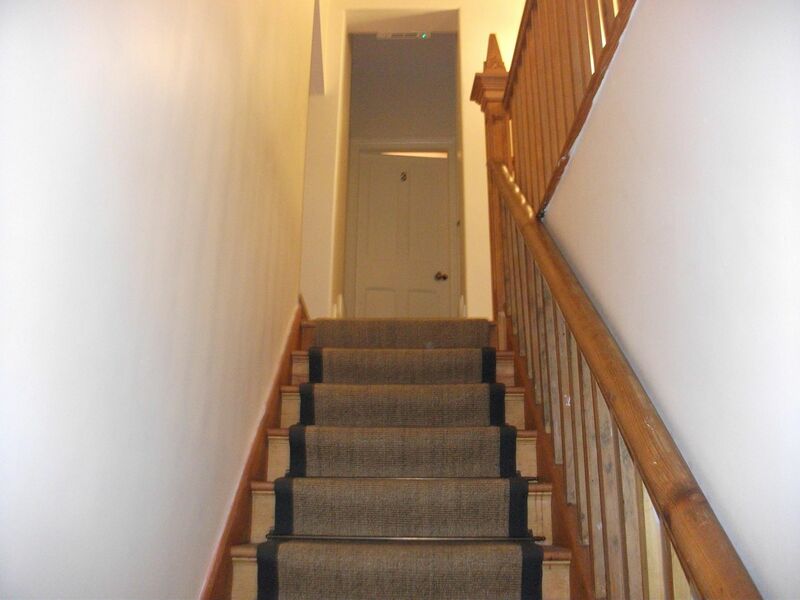 Laura's report: On the 3rd floor we seen a shadow peeping round the wall on stairs. I also felt sick when standing on attic stairs. We aldo had a gentleman's shadow in the corner of the room. In the attic we didn't get much apart from a noise in the corner. Me and Belinda turned around to see a hand side white orb float across the wall. Ground floor we had a few words come through on box... Still born. Birth. 10. Paul's. In the basement we went to the furthest room. On this I started feeling pressure in my head, I seen a gentleman in the corner of the room. I also had a very tight chest. On speaking to him through the pendant he said he wanted is there, I asked again a couple of questions later as heavy feeling got worse. He then said he didn't like us there. So we left on leaving we herd a voice and then on the box it came through devil and evil. At this point we all left and got Steph. Charlotte's report: Area 1 was the cafe- we used the iovilus and got the words legion, measure and object. We also used the spirit box and some of the girls were talking to a Robert through this. In the snug there was a cord next to the glass that kept moving. K2 was flashing intelligently to questions. 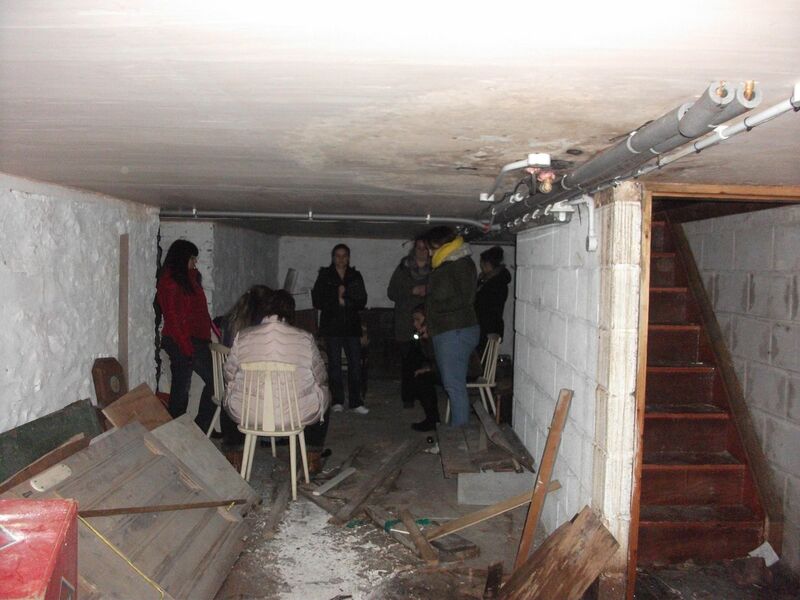 Area 2 was the basement we heard 3 clear deep heavy breaths in the middle room. we used the iovilus again in the back room and we asked if we were wanted in there and we had the words come and away so we asked why it wanted us to leave and the reply was fear then i said we’re not scared of you, are you scared of us and the reply was yourself, leave, thank and none. Those last 4 words were within 40 seconds of each other. We left that room because if felt heavy and oppressive in there. We then went to the room at the bottom of the stairs and was calling out. Some of the girls heard a stone being thrown at a piece of furniture. We also done some pendulum work. We connected with a female from the area, but didn’t work in the area, who said she was a good spirit but didn’t want us there cos if a danger. She felt lonely but not sad and was in turmoil as there was no heaven or hell. We then established the name Bethan who knew Bethany (one of the girls in my team) and she is looking after flo and Catherine. Bethany felt panicked and had to be reminded of grounding and protection. Area 3 - we went into the store room first and we did some scrying and ouija board and didn’t get anything. One of the ladies in the team wanted to try the pendulum so I went to get it out of my bag and it wasn’t there, I know I put it back inside the drawstring bag and back into my equipment bag into it’s allocated section (I’m very particular ) the drawstring bag was there but it was empty and I was really confused and one of the team pointed out that the pendulum was laying in a purposely perfect position on the floor in front of the trigger object teddy bear and the k2 meter and torch. How did I not notice it when I putting the k2 down? How did it get out of 2 bags without me noticing? We also had the ovilus on and we got the name Edna on it which the pendulum confirmed. Other words on the ovilus were geek, threat and agent (twice) and cord. We then went up to the attic and I checked the trigger object which had moved half a cm. some of us heard noises coming from the stairs area and felt a presence as if there was someone watching us. I was calling out and I had the replies fear and cannot on the ovilus. We also had the word measure, legion and shoes again? We didn’t find out how this was relevant. We also got bacon and wheat repeated throughout the night. Free time- I decided to go to the basement with Tom and 3 others who one I think was called Kate. We were scrying in the front room and all of us saw the same changes in Tom and Kate’s face. I had the k2 meter on in front of the mirror and didn’t flash once until Kate sat In front of the mirror and then it was constantly flashing. I moved it around to see if there was anything triggering it to flash and as soon as I moved it 12 inches anywhere away from Kate it would stop flashing. I asked her if she had a phone or anything on her and she didn’t. I moved the k2 all around her from her head to her toes and it was constantly flashing it was like her aura was the trigger so I said you must have a spirit with you jokingly and she replied yes I do, my daughter! I asked if we could speak to her and we did and she replied to us using intelligent stop start flashes, truly incredible! 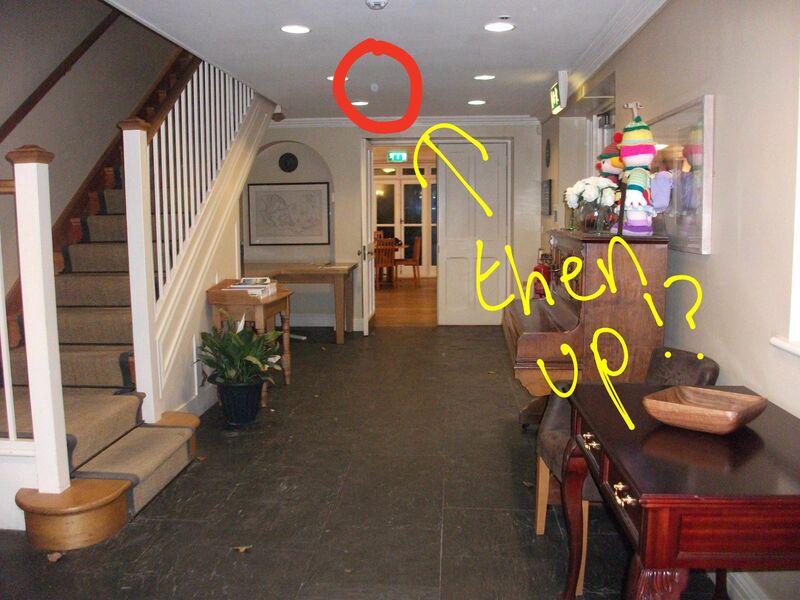 Last but not least I went to collect the trigger object from the attic and it had moved back to its original position. This was a new venue once again for GPI. Craflwyn hall is a 19th century house nestling in the Nan Gwynant valley at the foot of Snowdon which today is a hotel. Zoe and Stephanie were floating between all the teams throughout the night. The evening started with the welcome meeting our protection prayer and guided tour around the building to familiarise ourselves with the layout. We had a very eventful night there were lots of bangs, tapping and names coming up. Due to the amount of evidence found, all the evidence from all teams have been put together for each area. Area a; there was a lot of activity in this area including; tapping, banging, knocking, sounds of a ball bouncing, Zoe and Stephanie both experienced the feeling of a lot of people watching from the gardens. It was felt at the time, to be a Roman army or something similar. Green lights were also seen in the garden. There were a number of words given on the Echovox; prayer, hundred, threat. Also the names Jason and Thomas were given. 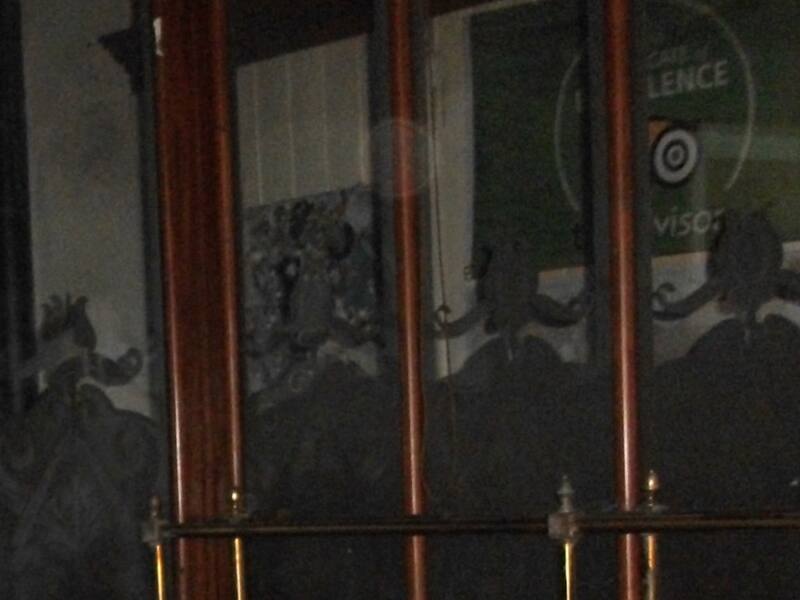 It was also felt that there was a spirit outside the bar window who was not very pleasant. This spirit was felt by two investigators. Crystals were used in this room as well as dousing rods and K2 Meter the crystals were picking up spirits one being a man whom we think drowned in a lake that was freezing cold as all the guests in the room went extremely cold and were at the point of shivering. We think it was in the 1930's. From here we luckily went for our break for a very hot cuppa which was needed. Area b; Room 4 there were noises coming from the bathroom which gave some of the guests a fright. The Echovox had a very nasty word on it which I cannot repeat! The Echovox had not even been turned on..
Room 5 had a lot of tapping from the bathroom and then the R.E.M pod was placed outside the room and it went off, flashing lights and alarm galore. We moved the R.E.M pod from its position and it went quiet when it was put back it started again. It has been mentioned that a dog used to sit or lie and wait for its owner to finish there jobs. Scrying was done in room 5 and an image like Hitler came through with ginger hair. 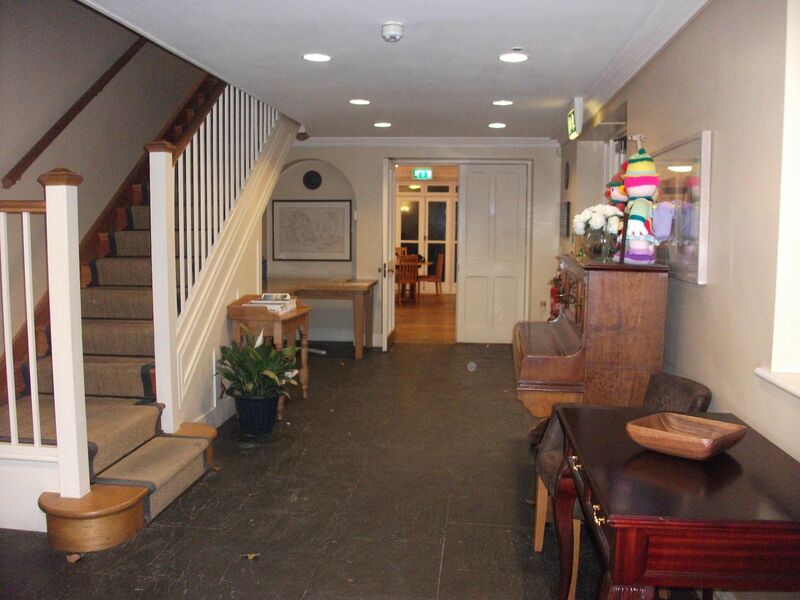 Area C; in the Stable and the Game Keepers House all teams found that the stables area was quiet. As we got to the game keepers house all teams picked up on death, either by hanging or illness/disease or possible shooting. Some teams experienced noises and shadows outside and other teams experienced a strong smell of scent like a rose water and a old lady scurrying around cooking and cleaning. There was also the presence of a child in the bedroom whom was very sad and distressed due to the death or illness, which was picked up by a number of guests. Not many names came through from this area but it was very active. Thomas, Owen, Mari, Lloyd, Hilter, Jason, Arthur, Evelyn and Robert. In area a there was the feeling of being watched by Romans. Zoe did some research and it has come to light that Roman soldiers had marched through the area. Free time: A lot of the guests and the team went in to the bar and lounge area (area a) due to the previous activity experienced in there. The same words came through on the Echovox; prayer, hundred, and threat. Dowsing Rods were also used and when asked if there were 100 men outside the dowsing rods answered "yes", which explains the word hundred. A fantastic night with plenty of unexplained activity. We will definitely be going there again next year! This was a new venue for GPI to investigate. It was built in the 15th century and is famous for being the home of war time Prime Minister David Lloyd George who died in the house in 1945. It is a beautiful building surrounded by gardens and wood land and is now used as a holiday destination for writers. As always, before the investigations started we had our welcome meeting, protection prayer and walk round the building. The night started off on a quiet note all the teams went to their areas and started the investigation. Laura's team picked up a gentleman called Albert a child called Tom and a man called Robert who was also picked up by Stephanie and Zoe. Team 2 had the name Tom/Twm in the same area as team 1. There were knocks scratching and very intelligent flashes from the K2 Meter also some response from using crystals and dousing rods. The attic was a little quiet in the bedrooms on 2nd floor crystals where used and the name Michael was given and after various questions asked by Various guests we think he possibly worked for David Lloyd George. Team 2 in the attic had different activity they had a picture fall off a wall. It seemed there was different activity throughout the areas but the same names where picked up throughout the night. In the conservatory there was flashes of light witnessed by the guests in the library. All teams noticed some sort of activity. Team 1 had scratching from a chair team 2 the name Gwenda came through and a camcorder which was being used kept on being paused and the team noticed a beeping noise as if the button to pause was being pressed. There was also the sound of a dog growling in the library and the name martin was sensed. A little girl came through on the dousing rods with team 3. In the base room, the Ouija board was set up. There was a lot of K2 activity in this room. Team 3 experienced a lot of banging and shadows under the door in the ground floor bedroom and the sound of a mirror being tapped. They also heard other loud noises. The K2 meter was flashing throughout all of the activity. This was a very interesting room. In the small lounge at the front of the house a lot of strange noises was heard, Tapping, scratching along with shadows being seen. A lot of noise seemed to come from a cupboard in the room. On inspection, a book was found to be sticking out of a pile of books on a shelf in the cupboard. The book was called The Holy Ghostbuster and at the exact time, the word religion came up on the echovox along with the name Robert. Scrying was also carried out throughout the night in one of the upstairs bedrooms. Team 2 saw the face of a male stroke victim. Throughout the night some guests were experiencing frontal headaches in the bedrooms on the 2nd floor and coldness was also noted and breathing on the backs of necks. 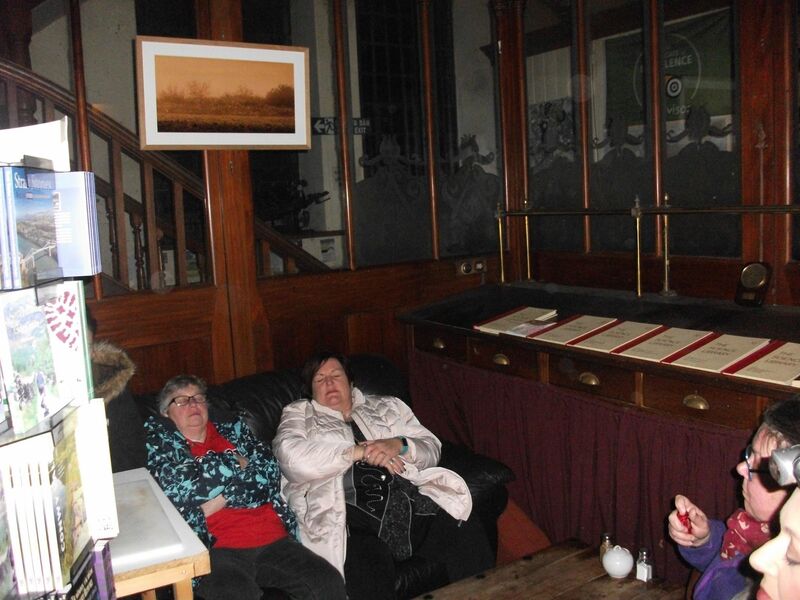 All in all the night was very active and was a very interesting venue to investigate and we look forward to going back again in the future to Ty Newydd. The team investigated the Dragon Theatre in Barmouth, Gwynedd on the night of the 24th June 2017 between the hours of 22.00hrs and 04.00hrs. The theatre was originally a church and was built in 1890. 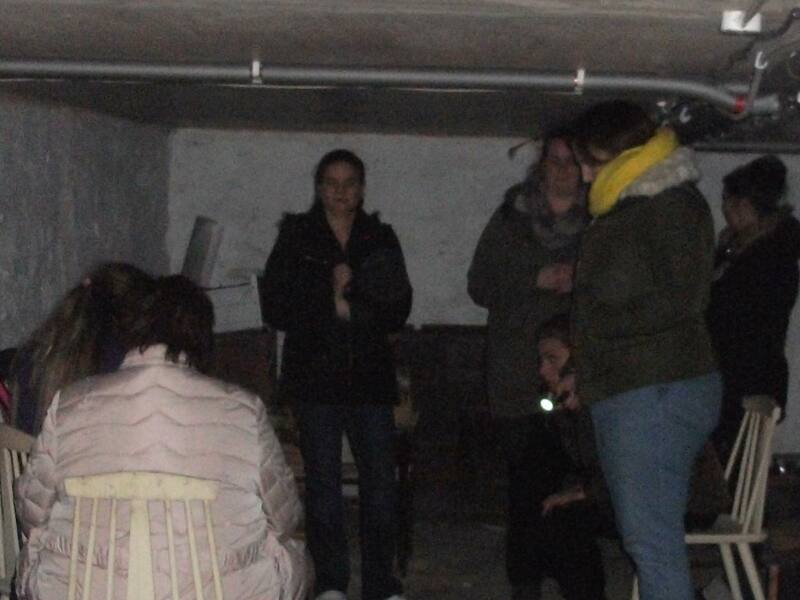 Team 'A' was led by Stephanie and Zoe and they started their investigation in Area A which was originally the main body of the church and is now the auditorium. Team ' B' was led by Charlotte and assisted by Jill and their investigation started in Area B which are the classrooms and dressing rooms. It was agreed that at approximately 01.00 hrs the teams would have a break and then swap locations. A low growl was heard and the outline of a small animal ( a cat) was seen. A male spirit was detected to the right of the stage that seemed to not like the team being there. Some of the guests felt they were being watched and Stephanie felt that someone was behind her. The name Billy was given. A chair was moved and the pendulum was very active in this area. The lights of the shadow box went off even though the batteries were new that night and it was fully working. A lot of shadows were perceived, particularly around the doors and the 2 private boxes in the gallery. A standing seance was performed on stage by Jill and the guests and was observed by Charlotte from the gallery. Even though the energy was not unusually high on the stage during the seance several spirit presences were felt by Jill. These appeared to be mainly spirit children and in particular a female child who seemed to enjoy singing. Some of the team sang ‘Away in a Manger’ to try to encourage more communication from her but she seemed reluctant and shy. A small animal, either a cat or dog was also sensed at the rear of the stage. -The team tried table tipping but no results occurred. - The spirit of an angry lady who hurt children was sensed and the echovox produced sounds which seem to confirm this. - The name ‘ Eric’ was shouted and the team were told to leave. - In one of the dressing rooms the team perform a scrying exercise and the image of a young lad who was wearing makeup and crying was superimposed onto the face of the team member who was sitting in front of the mirror. The name Edward was given repeatedly to Jill and at first it was thought to be connected with one of the guests. It was later discovered to be the name of Edward Williams who was Chairman of the Church Council over many different years in the early 20th Century. His name was displayed on the original Church Board further along the corridor. Curtains were seen to move a lot in the classrooms particularly at ground level and no reason could be found for this. e.g draughts/ gaps in walls or Windows. The temperature fluctuated considerably in these areas. The name John Emyr was also given to Jill. The Ouija board was tried in these areas and it was seen and felt to vibrate. The team also attempted scrying and some facial distortions could be seen on the team member. Both teams felt that in both areas of the Dragon Theatre there was evidence of physical and mental Spirit communication. The guests were given time to explore the areas by themselves before the investigation was concluded at 0.4.00 hrs. An interesting night was had by all. What a great night we all had at the lovely Plas Machynlleth. This was our second investigation here. We were split up in to two teams. Team one was Lead by Stephanie and Laura, team two was lead by Charlotte and Belinda. The Big Boss Lady Zoe worked between the two teams. The night started off with the welcome meeting and the walk around the building with the lights on to familiarise ourselves with the lay out and any potential hazards. Once we were placed into our teams it was time for the investigating to begin. 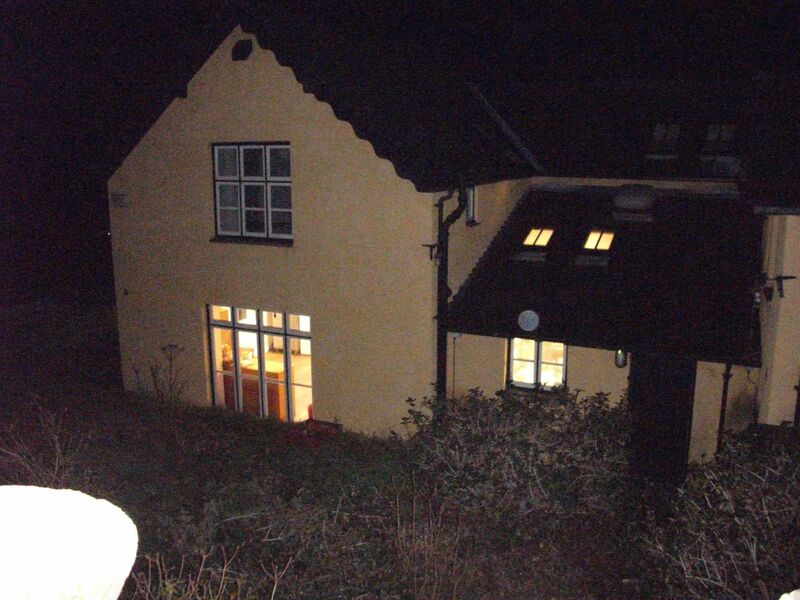 The night started off very quiet but by the end of the investigation we had all experienced some activity which included tapping, banging and screaming which was heard by both teams at the same time in different areas of the building. We also had a lot of names mentioned by both teams which related to the building in the same areas both teams had investigated but obviously at different times. The equipment that we used throughout the night worked well. We used an echovox and spirit box, crystals, EMF meters, lazer grid pens and lazer thermometers. We noticed the K2 meter was not working well for some reason but it did however work in the base room when it had been left on by accident, where it was going wild. We all found the building to be hot and stuffy. even when we requested that the heating be turned off it still remained extremely warm. The temperature outside was starting to drop and eventually it did cool down inside. For free time most of the guests wanted to go back to the cellar and the attic as they felt that most of the activity was in these two areas. Some photos were taken and have already been posted on Facebook. Some very interesting unexplainable CCTV videos have also been posted to the GPI pages that had been recorded a couple of years ago. All in all we had a very eventful and exciting night and we cannot wait to return and continue investigating this wonderful building! Wow, how fabulous this place was! Full of activity and atmospheric. This used to be an old drovers hotel and was listed as a grade II in January 1996. 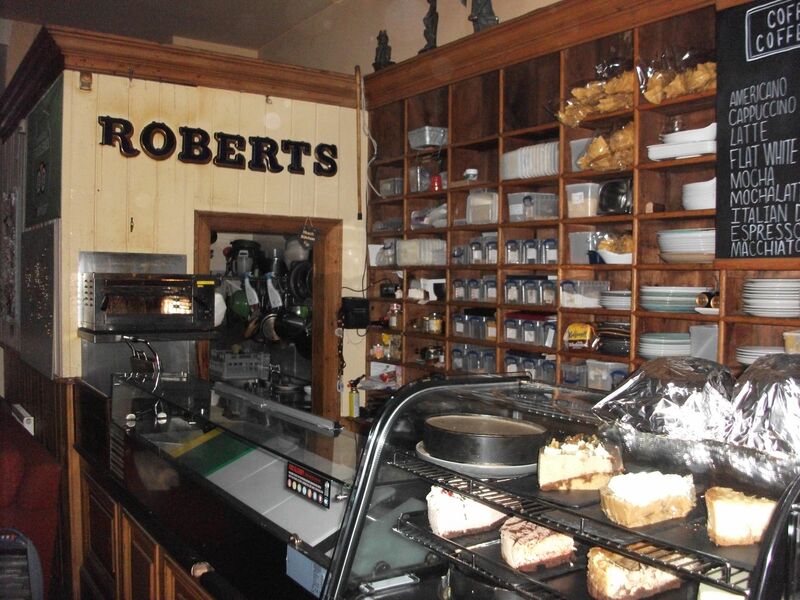 It has always been a hostelry and has seen many owners during the years. It was built in 1728 by the Lewis family of nearby Pengwern Hall. It was extended in the early 19th century and again in the third quarter of the same. Although we had access to the majority of the area, some places were under refurbishment and were difficult to do some experiments. The whole area made you feel as though you were being watched. We divided into two groups after our initial investigation in the public bar area. 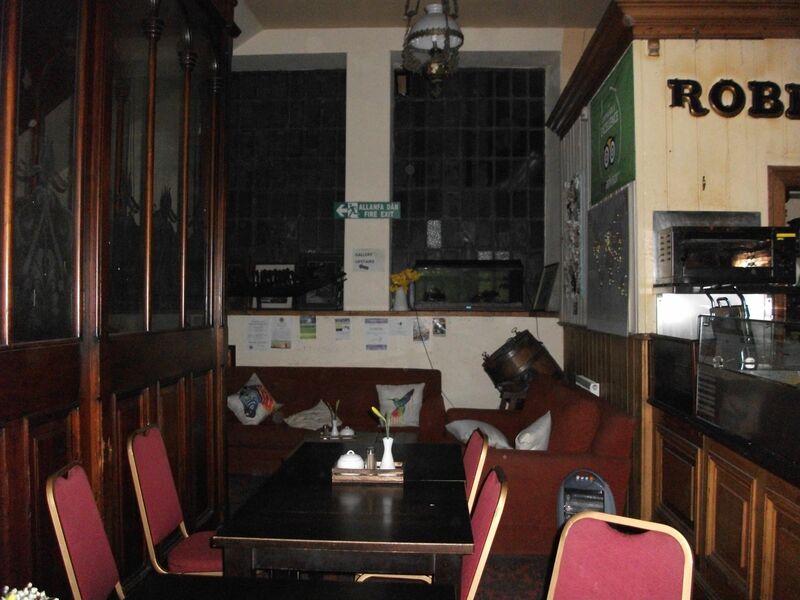 Many orbs were witnessed in all areas, namely, bar, dining room, old bar, cellar, kitchen, games room and bedrooms. Voices were heard and knocking noises, windows rattling (although fairly windy at the time, the rattling was after the wind subsided). Plenty of light anomalies, children giggling, whistling, and even a black dog making an appearance. Humming was also heard by everyone. Scrying was achieved in the bedrooms and footsteps were heard throughout. Contact was made with various spirit and lots for us to research. One of our team picked up on a famous person staying there, the author of Wild Wales, George Borrow, visited in 1854 and described the landlady, Martha Owens, as “queer looking” and “ blunt manner”, her sternness was picked up by members of the group. Lots of names mentioned. On the whole, a fabulous night was had by everyone and can’t wait to return in the future. Another chance to explore this truly beautiful building full of history and tales of woe. Olivia, Sam and Helen were on the team this evening and we all started on the walk around full of anticipation of the unfolding events for the night. We were joined by Willow Team, up and coming mediums from the local area. Weather was dry and chilly. This is a weird place to investigate, some areas with plenty of activity, then – nothing! Spirit move from place to place very quickly, You can be having a conversation with one, then they disappear. Some of the people we talked to were a large lady who was a warden, the guilty men who were punished by hanging, members of the police force, children ensconced within the system. Some folk happy, some not too happy we were there! 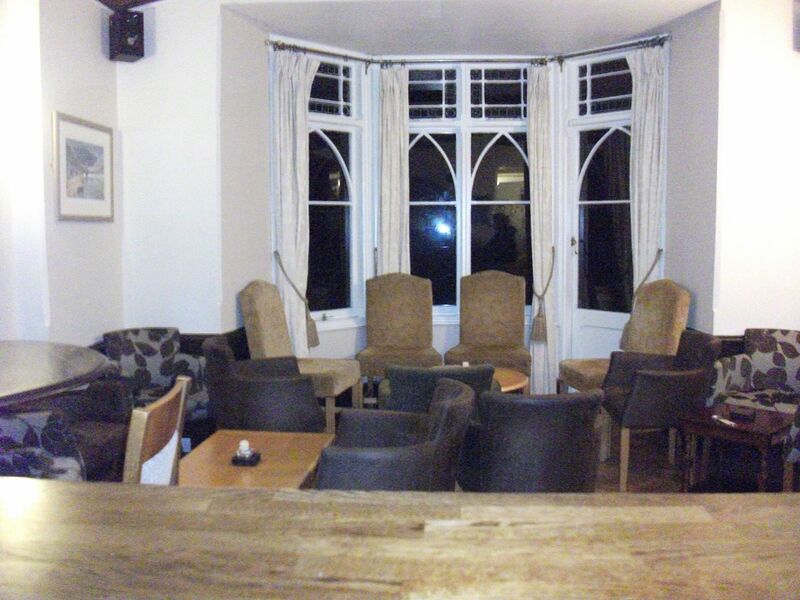 Photographs were taken, at least some were, one lady had difficulty working her device (spirit activity playing her up), orbs captured on camera and also viewed on CCTV. Tapping noises were heard and I think we all felt that we were being watched! A great place to visit, for the atmosphere, the history, the stories and I know that the team shared the evening with some really lovely people. The first investigation of the year and we all looked forward to visiting this place. It has never been investigated so we were unsure what to expect. As this is a work in progress project we were unable to access all areas due to either health and safety issues or because other people rent the areas. It was freezing temperatures (felt like it) range about 6-8 degrees inside the building. No heating was available so we all dressed in our thermals and prepared to investigate. We had two groups this evening, one led by Graham and Sam and the other by Olivia and Helen. After our initial walk round to familiarise ourselves with the areas we then ventured out with our groups. Initial findings were that there was not an awful lot of activity there. Although we sensed some people were watching us, it appeared to be a bit flat. Very little evidence was reported at the property and we also found this to be the case. We do feel however, that this could be caused by the lack of investigation here and maybe the residents (spirit) just need a bit of time to get used to the idea. Maybe, in future, more activity could perhaps be obtained. Considering the history of the building, and happenings that have occurred, you would expect more information to be available with consideration to activity. However, some photographs were taken on the evening and on the reconnaissance visit that are shown here. Make of them what you will. Who knows what could lie in store for future visits? The Castle dates from the 12th century and is currently being used as a Youth Hostel. It lies on a hillside on the outskirts of Lydney in Gloucestershire. This event was shared with SPOOKS from Swansea. The building itself is very picturesque and full of history. Stone walls with carved wood feature all around the interior and the exterior gleams with romance and knights in shining armour, surrounded by a now grass moat. Our investigation on the first evening was intermingled with the other group and our group proceeded the next night. 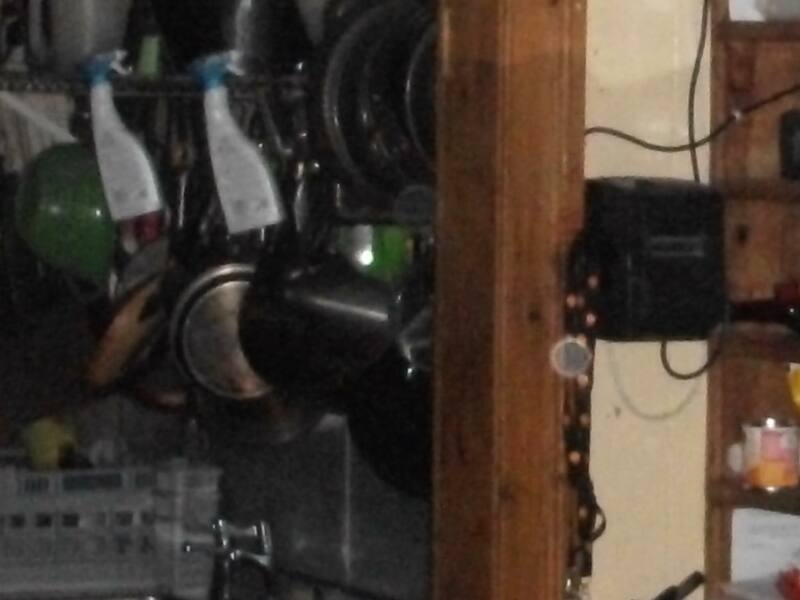 Kitchen area: Evidence here of a William, Lady Isabella, apples, small boy named Bobby hiding as he had been scolded, blonde girl called Sarah, a Scottish connection, also a fire that occurred here. Prison: A very angry man with long hair, sweaty and scruffy shouting Henry. Hanging Room: Here a lady was crying, time period of 1800’s, she lost her husband a soldier, Boer War, a small girl child, a fan. Guard Room: Get out, Scotland, Colin, everybody out was sensed. Oubliette: Peter was thrown in the pit, Timmy a small boy was thrown down for stealing bread, pieces of 8 (twice), hands, sickle. Constable Room: We did some chair tipping, Lady Clarice (1900’s). Chaplains Room: Clergy, Craig and Mills were sensed here. Timothy Williams, pictures, hand holding, sickle, we used a ball with numbers on and it showed the number 8 twice, also sensed was a boy connected with clergy in a nasty way. Some members slept here and one was affected by having her foot touched during the night. Sir Johns Room: Simon who was overwrought, Ben. Some photos were taken in this room but failed to develop. Also a plan was unveiled about changes to the building, but the owners were not so happy with this. We captured an evp recording of a woman saying Yes. Chapel: Child at the door, soldier, flu epidemic, 1918, curtains moving, playful lady. Stateroom: Children playing, running up corridor, spots/blisters/smallpox/plague. On the whole it was an interesting place to investigate with many layers of time involved. Not many things can be substantiated but there is evidence that a fire did indeed occur which resulted in the death of a person. We started at 9pm in the base room, connecting to each other by holding hands to build the energy, and also to be able to ground & protect ourselves. Keith saw two children sitting on the stairs watching us. It 10pm we are move up to the main house. We are separated into three groups. In the childrens room, Samantha heard a baby crying there was also the sound of an argument and screaming but further away in the house. Samantha felt a cold draft in front of her. Into the next room, Llywela felt uncomfortable and not safe in this room, John said there was an agitated man saying it was his house! In the dining room, Louisa was sitting by the fire when the chair she was sitting on started to move she said she felt really cold but when she left the room she felt very warm. Louisa felt light-headed down in the cellar, we heard footsteps coming from the cellar stairs. Whilst upstairs, Elaine Lee was outside the small L shaped bedroom and felt her heart racing. She said she felt really scared and didn’t want to go in there. When she was in the room she didn’t feel safe and felt like she wanted to crouch into a corner and didn’t want anyone to come near her. It felt really warm in the bedrooms. When they closed the door Louisa saw a shadow walking past. One of the other groups also saw a light underneath the closed door and a shadow across the gap. Between 11pm and 12am one of the groups went into the dining room, Graham had a male coming through telling him to move to the drawing room so we did. Sitting in the drawing room, Llywela felt someone behind Graham, a man but Graham said it was a women who’s behind him and she didn’t like that he was there. 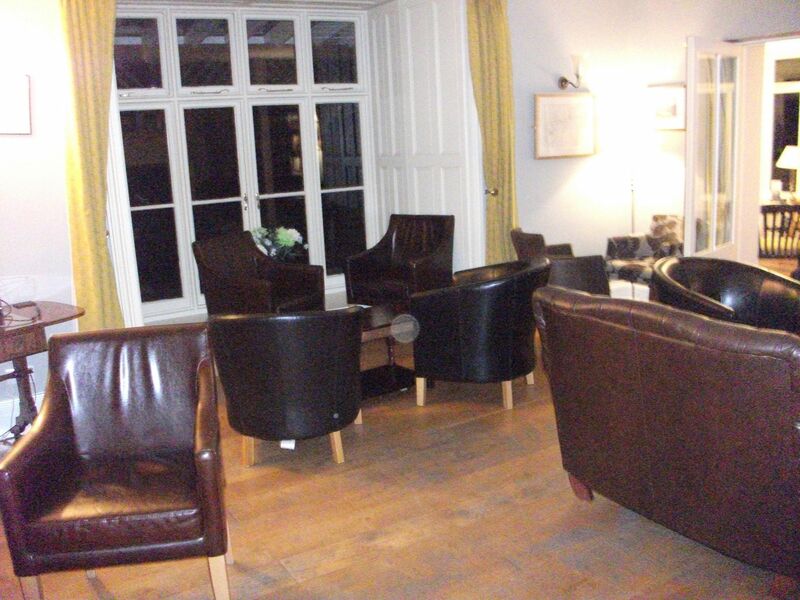 We all heard a tapping noise, near to where Carol was sitting, then we all heard quite loud footsteps which sounded like they were in the corridor that runs along side the drawing room. 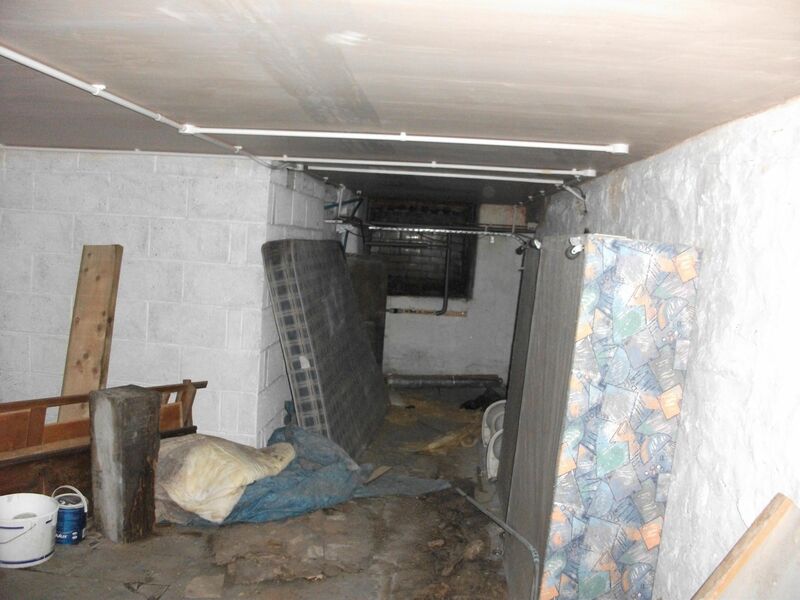 Down in the cellar there were footsteps and also someone heavy breathing. The whole group heard the tricycle moving, it sounded like a squeak of pedals or wheels moving. Mason felt someone was watching him. The Beam alarms went off. It between 12am and 1am, upstairs in the mezzanine room, Zoe saw a lady standing by the ironing board also everyone hearing footsteps outside the bedrooms. Down in the cellar, we connected our energy together, by holding hands. Elaine felt there was a man standing behind her and his energy was very close to her. Olivia assisted Elaine to tell the man to back off. A few minutes passed and Elaine felt much better but the spirit didn’t like that we were in his cellar. In the other part of the cellar, Samantha felt someones hand on her neck which she didn't like. Llywela didn’t feel comfortable either as they both had tight chests and painful headaches. Samantha and Llywela couldn’t stay in the Cellar so they left to join the other group in the dining room. Sam then went back to the base room. Graham thought he saw something walking around the grounds outside. Elaine Lee felt something rush up to the side of her as she felt her hair move, the nearest she could explain it was as if someone was going to slap the side of your head. Towards the end of the night, we split in to 2 groups. 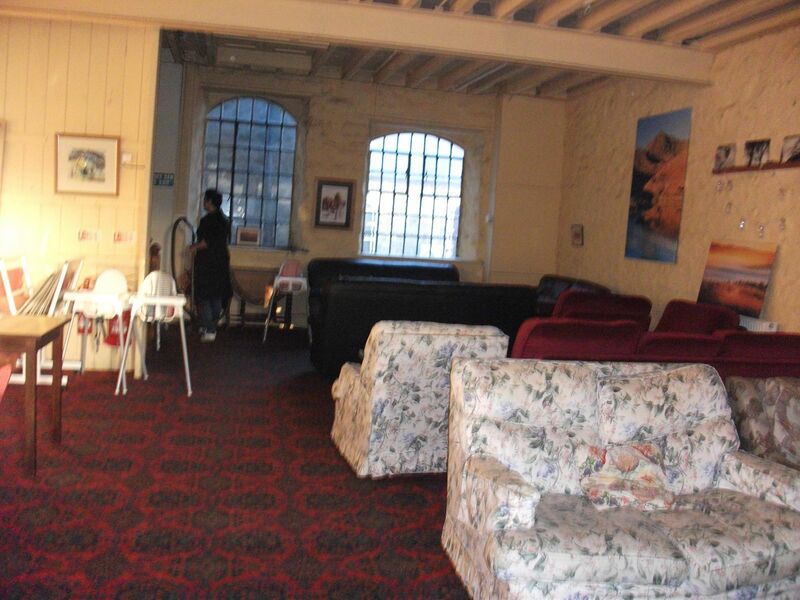 One group went to the old grain store/childrens play room but unfortunately there was no activity. The other group went to the old and new stables where again, there was no activity. We finally went back to the base room where we turned the light off and ask for any spirit to come through to us. We all heard a loud bang which sounded like a door but we couldn't work out where it came from. 22:00- The whole group were sitting in the base room (in the basement) in a Circle to do meditation, grounding and protection continuing on to do a do a Seance, everyone is holding hands, asking the spirits to come through. One of the group saw a man looking through the window on the door of the kitchen. She wasn’t comfortable seeing this spirit, so she moved to a seat where she could not see. A few other group members also saw a shadow passing the window in the kitchen door. The woman sitting beside Sam felt a cold breeze behind her and down her arms but Sam felt warm. Emma felt a negative energy near her and she got upset but she was OK. She was trying to keep herself calm. Shane saw someone behind another member of the group, this person now felt someone touching her shoulder. She felt quite relaxed and so was Shane. Zoe felt a cold breeze behind her and could feel an entity there and at the same time Jane felt it too. Jane and Zoe were sitting next to each other. Olivia ask for the beam barrier alarms to go off but unfortunately they didn’t. There felt like a spirit was going around the room. The woman sitting next to Sam heard what she described as children singing. In the theatre, members were sitting in the chairs where the audience sit. Zoe sat on the stairs to the stage. She felt someone behind her, she was calm. Sam and LLywela got up and sat on the stage. LLywela felt someone behind her. LLywela got a bit scared and uncomfortable and went off the stage. Sam stayed sitting on the Stage and felt a cold breeze but nothing else. Carol and Sam both took a photo of the theatre door. 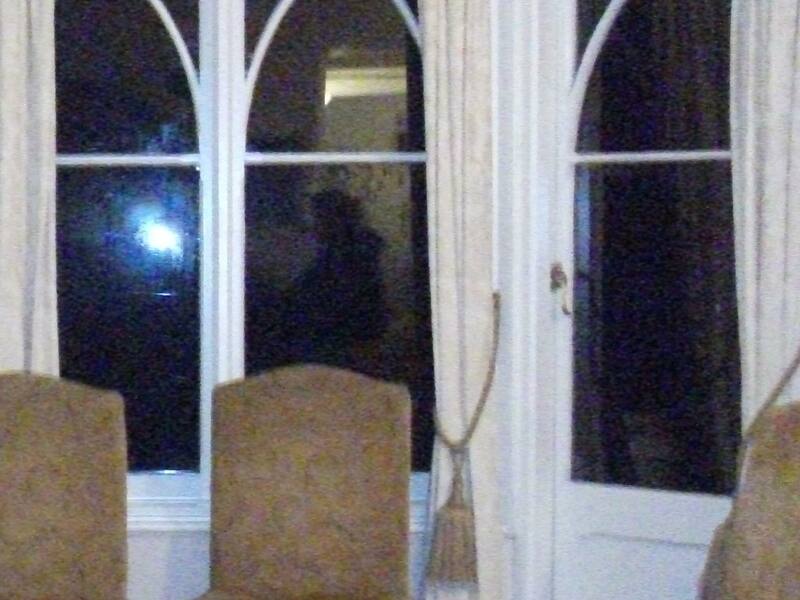 In one picture it looked like a little boy is looking through the window and on the other picture taken a few seconds later the little boy appears to be looking down. We all heard a very loud banging noises coming from the left corner of the building. It kept stopping and starting. Jane started to use the dowsing rods and appeared to make contact with a little girl. Jane asked her if she was Welsh, to which she said yes. After a series of other yes and no questions, we managed to ascertain that she was evacuated to Barmouth, she died in Barmouth and she was around the age of 10-11. The very loud banging is still coming and going so we all went out to the front door of the building and listened again. The noise was louder here but we were unable to find where the noise was coming from who what was causing it. All members felt calm and not scared. Moving up to the classroom. 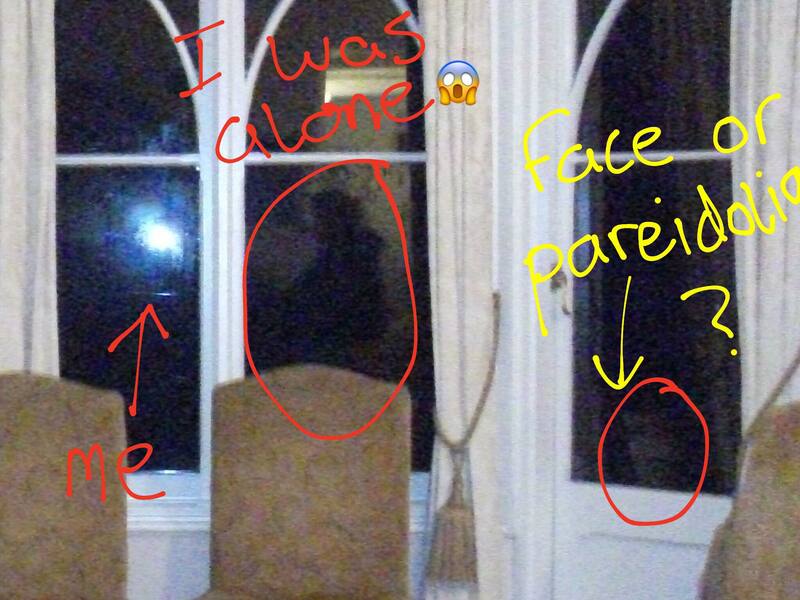 Zoe asked if there was any spirit in the room with us can you please make a noise and the door clicked. Sam was sitting near the door and felt a bit uncomfortable and a bit scared. The clicking of the door carried on. Members of the other group heard footsteps in the corridor outside the classrooms. Olivia's group decided to place one member of the group at one end of the corridor and one member at the other end so that they could try to witness where the noises were coming from. Olivias group were now in the Theatre. One of the members saw an old man on the balcony. Another of Olivias group got the feeling of being strangled and her mouth went all dry. Zoes group went into the other classroom with a Ouija board. Carol, Llywela and two other members sat around the table but we didn’t get anything from the board unfortunately. Then Sam, LLywela and the other two gave it another go and a spirit did come through but it appeared to be a mischievous spirit that just wanted to mess us around. LLywela asked “can you spell”? The answer was “no”! LLywela asked if we had contact with a little girl and the answer was “yes”. Asking how old she was, the spirit indicated that she was only 2 years old. The little girl had gone and we had a 36 year old man through. He was apparently an actor who lived and died in the 19th century. 3:00-04:00 Round up and discussion of nights events. Compare notes with the other group. Some of us went up the back stairs taking care not to set off the Beam alarms. 04:00-05:00 Free time - We went up to up to the middle class room. Whilst we were in the classroom the beam barrier alarms went off. Zoe went to see what had caused them to activate but could find no explanation. The alarms would not reset so had to be turned off at this point! 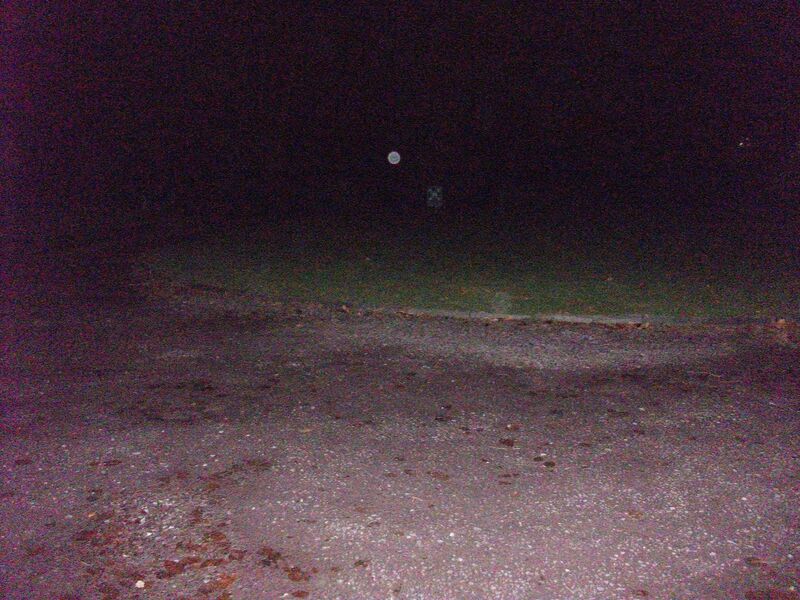 LLywela took a video at the top of the stairs and there were a few white orbs floating around. None of the group members appeared to be scared. We decided to go into the other classroom where we sat, asking for spirit to come through. Footsteps were heard outside in the small garden at the back of the building and the back door handle was tried. Llywela and Zoe went outside to see if there was access to the garden which there was. They also slammed the back gate 2 or 3 times and asked the other groups if they were able to hear it. It was thought that this may have been the cause of the very loud banging earlier in the night but unfortunately none of the other members could hear the gate being slammed, only the people in the nearest classroom. Sam went back up to the theatre with Emyr. She thought he had come into the auditorium with her so she switched on her torch and looked around. She then realised Emyr wasn't there! The doors were closed and then she heard a door slam somewhere else! She got scared and ran back to the base room. By this time the rest of the group had gone back to the theatre. Paul, Shane, Llywela and David used the the Ouija board. Sam and LLywela decided to go back up to the class room where Olivia, Zoe and the rest of the group had gone. They were using the dowsing rods. One member started with rods and after asking a series of yes and no questions it was established that we had contacted the spirit of a lady in her 50's. She was married and had no children. Another member took the rods and continued to ask questions. It was discovered that the lady was a teacher of the Tower School in Barmouth. Hesrself and her husband had passed away and her husband was a vicar who also worked at the school teaching Religious education. She said that both of them had died in an car accident and they were buried in Harlech. 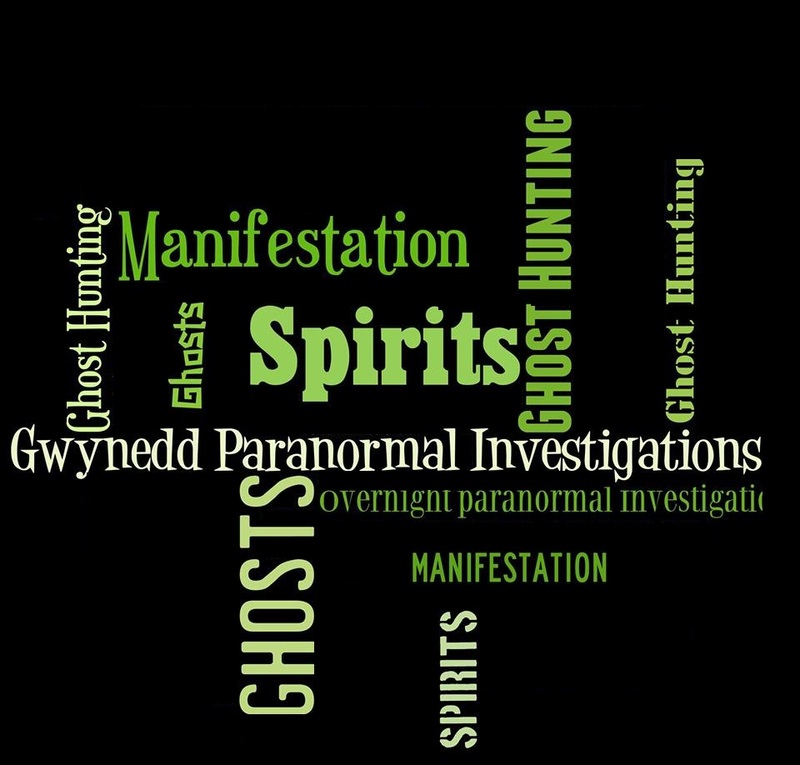 This event was organised primarily for Anglesey Paranormal Society. We split up into 3 groups and went to designated areas. What a great night. Knocks and bangs, bumps and all sorts going on. Some great results on the Ouija board and devining rods. A few names came up and were confirmed afterward by Graham Sizmur (previously of 3rd Eye Paranormal). A group of us in the gallery heard whistling, a number of people in different groups reported hearing someone say "hello", this was then reinforced by an EVP recording of something sounding very much like a 'hello'. There were 9 separate EVP's from many recordings that were taken throughout the night which have all been posted on our Facebook page. A relatively quiet night compared to other locations but some activity none the less. We heard a few bumps and bangs, 3 different doors closed by themselves with no explanation (2 of them were automatic fire doors and therefore were 'locked' open on the automatic mechanism). We managed to record whistling on the voice recorder and some other unexplainable and inconclusive noises. We contacted an anonymous (his choice of words as he refused to provide his name) Captain on the Ouija board. He claimed to have died in France during WW1 and came from 'Dolgelly'. We did manage to find a little information on t'internet after of a Captain who came from Dolgellau. A light bulb mysteriously fell from the light fitting in the ceiling in one of the bedrooms. Lights and shadows were seen in some of the bedrooms but especially in the old hall. We picked up an unexplained loud bang in the 1st floor corridor on the camcorder followed by what sounds like heavy breathing. The breathing went on for around 10 minutes then seemed to fade away. Total money raised from this event was £25 and therefore will be added to the next event and donated together. We had a relatively quiet night overall. The usual bumps and bangs, the beam barrier alarm went off after being placed at the top left hand side of the staircase. One of the group member picked up on the spirit of an old gentleman in the cellar. And 2 seperate mediums in 2 groups got the same name in the dining room. Well, what an eventful night. It started of quite quiet but soon things started to pick up as the night went on. We seperated in to 2 groups and investigated 3 different area's of the property. We placed a video camera on the balcony which overlooked the hall so it was pointing along the balcony from one end to the other and we also placed a voice recorder in bedroom number 4 directly above the room we used as our 'base room' which is currently used as a common room. We had problems with the voice recorder at the begining of the evening where we were unable to get a signal from the microphone/sender to the laptop, eventually after Olivia wondered around the building testing it, we finally managed to pick it up directly above us however, when I came to listen to the recordings we had made over the night, there was nothing clear enough to hear on the saved files. So we split up and went to different areas of the building and almost immediately started to experience unexplained activity. Group 1 (with myself, Zoe) experienced pin prick sparkly lights, tapping sounds, unexplained orb like lights, we heard loud bangs like a door slamming shut twice and after checking that it wasn't the other team, we cold not explain this. We also experienced voices and could not explain where they were coming from. It sounded very much like a woman and a man arguing. We went in to one of the staff bedrooms which is on the 'tower' and experienced tapping noises, bangs, unexplained shadows and lights and this was also where we heard the loud bangs and voices. A number of people reported a strange laugh, almost a cackle, at random times throughout the night and I for one had put it down to a very noisey automatic airfreshner spray in the mens toilets however, after reviewing the video it seems that this horrible haunting laugh has been picked up and it actually doesn't sound anything like the airfreshner at all! This was such an active building, it's a shame we didn't have a bit longer to investigate. Hopefully, we will be returning in a few months time. 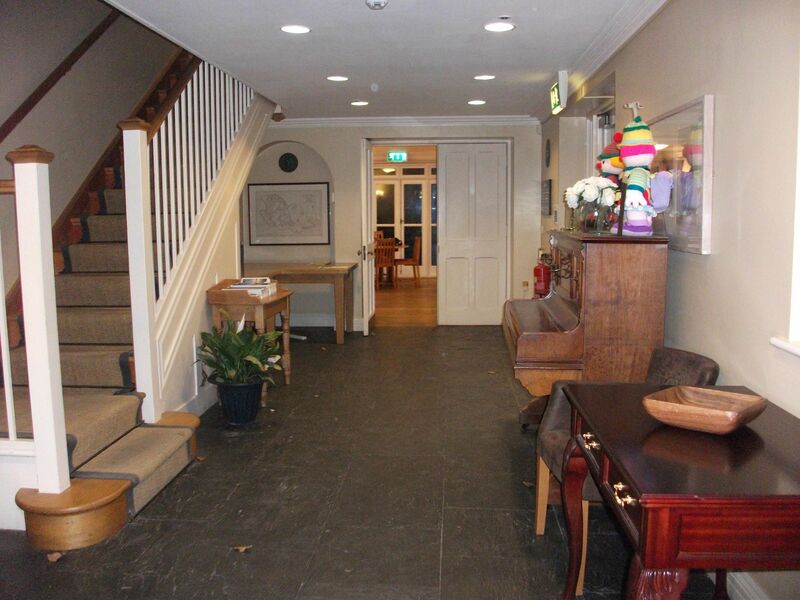 As we were downstairs in the bar conducting the welcome meeting and seperating into 2 groups, the video camera had been switched on and left to record along the upstairs corridor. Just before Olivia's group went upstairs there was an unexplainable noise on the recording. It sounded like someone shuffling through paperwork or something like that. There were some odd bumps and bangs too. Although there was a cat and a dog in the area of upstairs, it didn't sound like any noise that either of them could have created. 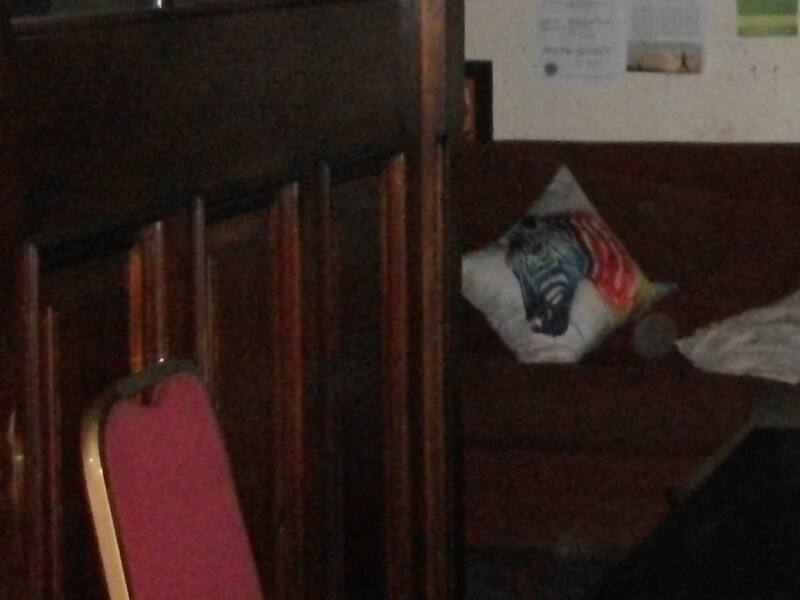 My group downstairs experienced shadows, noises and one of the pump badges seemed to turn round too. There were strange flashes of red lights, almost like a laser. We heard voices, it sounded like people arguing and also we heard a scream which nobody could explain. 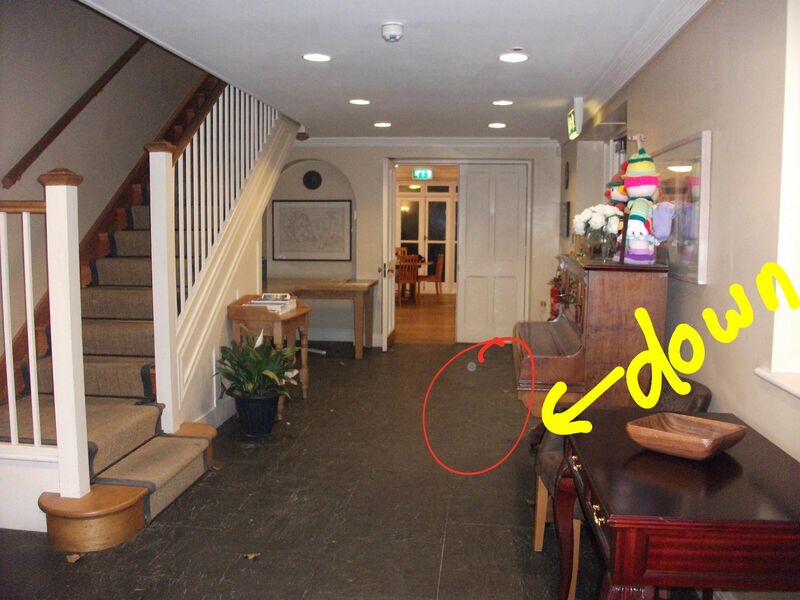 We didn't get a lot of activity upstairs but whilst using the dowsing rods, we apparently contacted the spirit of a little girl. by asking questions with a yes or no answer we managed to establish the following information: She wasn't quite sure how old she was but around 10 years old. She had lived in the pub but didn't die in the building. She said she didn't die in the village at all but she was buried in the church, in the village. She had lived between 100 and 150 years ago and died as a result of poisoning. She said it was an accident and she had eaten something which was either poisonous or gave her an allergic reaction. She said she was alone when she died and nobody knew how she died. She said she was happy and she was now with her family. We thanked her for contacting us and left her in peace. I will ask Olivia to add her account as soon as she can. Well what a fantastic night! We started off with the welcome meeting and a walk around of the building to familiarise ourselves with the layout with the lights on. We split into 2 groups, Olivia lead one group into the auditorium and stage area and I took the other group to the dressing rooms and classrooms at the back of the building......and then we began! A camcorder was placed in the auditorium facing the main door and left to record in night vision. Smaller of the 2 classrooms: We started off with the Franks machine (a radio scanner which picks out single words supposedly in answer to specific questions). We asked if any spirits were in the building who wanted to communicate with us and some random words were picked up on the radio. We asked for a name and we all heard the name Fred or similar. We then asked a few more questions and again heard random words from the machine then we all heard the name Elisabeth. We weren't really getting much joy from the Franks machine so we decided to call out in the room. We didn't really get any 'activity' in the first room so we moved on to the dressing rooms. In the 1st dressing room: Llywela sat in front of the large dressing mirror to try a bit of scrying. Nothing really happened as far as her face changing but there seemed to be a bit of 'movement' in the room. There were tiny sparkle lights that a few of us saw and the light reflection from the window seemed to dance around a bit. We called out for any spirit who wished to communicate with us to make themselves known. We had a few odd noises that we were unable to explain. In the corner of room next to Chrissie was a circular clothing rack/stand full of coat hangers, I asked if there were any spirits in the room with us could they please move the coat hangers. On that, there was the very distinctive sound of 2 coat hangers tapping together very quietly which the whole group heard. We decided to move along to the next dressing room. 2nd dressing room: This room was slightly smaller than the first and much colder. We sat in the dark and called out for any spirits to make a noise. We heard a very feint knock on the door but couldn't be certain it was a definite knock. We asked again for any spirit to make a loud noise and there was a definite knocking on the door. As we sat in the dark, we heard unexplained noises, we saw shadows and one of the coat hangers on a rail swung from side to side. Michelle stated she saw the impression of a French soldier with white trousers and a blue tunic standing near the door. Kaye then jumped and said she felt something touch her foot. She said it felt like someone was standing next to her. We heard unexplained noises coming from the toilet area in the dressing room so we opened the door. There seemed to be 'movement' around the toilet door, radiator and main door and we saw shadows and unexplained lights. We heard movement outside the door in the corridor and also heard footsteps. A couple of times I had to ask Olivia if her group were in the vicinity due to the loudness of some of the noises. After the break we swapped areas and my group moved on the the auditorium and stage area: We started with Luke having a go with the divining rods. After establishing a yes and no movement configuration, we continued to ask questions to ascertain if we we communicating with any spirits in the building. This is what we found out; A lady called Elisabeth, from Harlech, who used to work at the Theatre in the box office/front desk was killed in a car accident within 45 years of the present time, she was in her 30's. Elisabeth was a passenger and another lady in the car was driving (she survived the head on crash). Elisabeth's little boy was in the car who was 4 years old at the time and he also survived. Apparently he is now in his 40's and still lives in Harlech. The other lady is apparently still alive too and is now in her 70's. She lives in Llandudno. If anyone can confirm or indeed contradict this information, I would be extremely grateful. 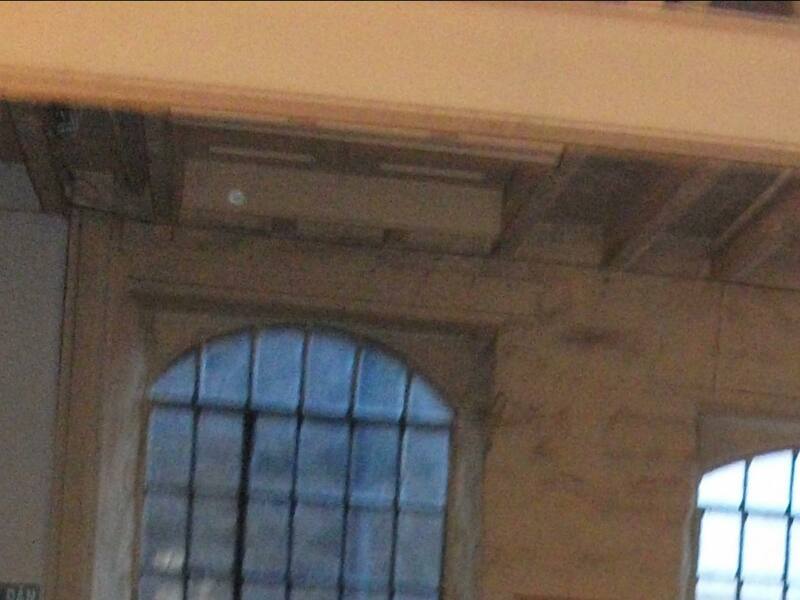 So, as we were 'talking' to Elisabeth, the beam barrier alarms at the top of the back stairway sounded. Olivia called me on the walkie talkie to check if we were all still together and nobody had accidentally set them off, which we hadn't. As I was telling this to Olivia the alarms started bleeping very rapidly in a way I have never heard before so we all ran out into the corridor and down to the stairwell. There was no obvious sign of movement so I picked up the alarms and turned them off. As we were all standing at the top of the stairs, debating the reason for them going off, we all heard some strange bumping and banging coming from the base room (basement) so we all ran down the stairs into the base room but nothing was there. As we stood, again debating the afore mentioned activity, there were what sounded like footsteps above (where the auditorium is). At this point we actually started to wonder if there were other 'real' people in the building! Olivia went up the front stairs to the foyer and checked that the main door was (still) locked, which it was. So we then decided to stay together as one big group and sit in the auditorium in the dark. Again a series of feint bumping and bangings were heard but nothing significant. I called out for any spirits in the building that may have set off the alarms, to please do it again as proof that they are there and do exist. We sat quietly for about 10 minute when sure enough, the alarms went off again! We all ran to the top of the stairs again to find no obvious signs of movement, I picked up the alarms and turned them off. We all returned to the base room where I examined the alarms and could find nothing wrong with them at all. They were working perfectly! In the meantime through out the night, lights would go on and off 'by themselves'. If we turned lights on, they would go off and if we put them off, they would come on! Just before the guests left, Gemma and Ethan went outside for a cigarette. As they stood in the courtyard with the door open, they could hear what sounded like furniture being dragged around up the stairs. On a previous visit with Kaye and my previous group S.P.O.O.K.S, we heard a similar sound from the stage area when we were in the dressing rooms. On investigation, there wasn't any furniture on the stage! Kaye, Olivia and I stood in the base room getting ready to leave and again we heard the footsteps in the auditorium above us. We walked around the building turning lights off and locking doors as we went and we followed Alison's instructions on setting the alarm and turned off the final lights in the foyer. As we left the building, the lights at the bottom of the stairs came back on and as we drove away from the building, we noticed there we 2 or 3 other lights on again too! I, for one, can't wait to go back again!